All pictured badges are for display use only. We do not sell badges. These machined eyelets are so close to the appearance of the vintage press in eyelets of yesterday that even up-close examination may not help you tell the difference! They have a vintage, as well as a modern look. We offer these, depending upon the hole size, in chrome (nickel) and others in gold (brass). And these eyelets can only be purchased from Jammin Sam. 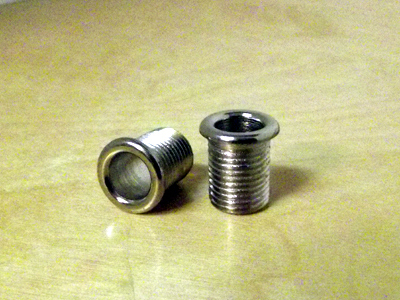 These 1/2″ machined eyelets, are for badges of today and yesterday. 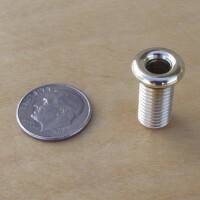 They are available in chrome (nickel) that fit in a 1/2″ hole. * Price when drum wrap is purchased (one per drum). If need more, give us a call. These 7/16″ machined eyelets, are for badges of today and yesterday. They have a vintage, as well as a modern look, in chrome (nickel) that fit in a 7/16″ hole. And these eyelets can only be purchased from Jammin Sam. * Price when drum wrap is purchased (one per drum). If you need more, give us a call. These 3/8″ machined eyelets, are for badges of today and yesterday. 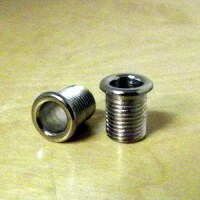 They have a vintage, as well as a modern look, in chrome (nickel) that fit in a 3/8″ hole. And these eyelets can only be purchased from Jammin Sam. These 5/16″ machined eyelets, are for badges of today and yesterday. 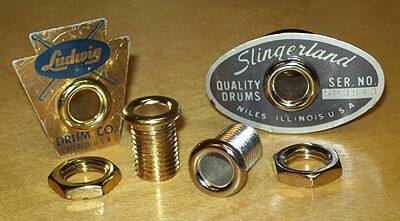 They have a vintage, as well as a modern look, in gold (brass) that fit in a 5/16″ hole.